 110-125 VAC, 50-60 Hz. 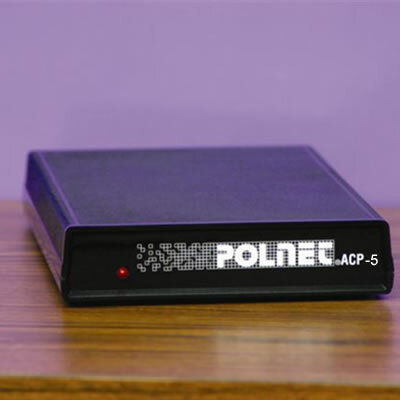 The Polnet ACP-5 is five port data polling call processor that eliminate up to four phone lines by auto-routing modems you connect to over a single business line. A dedicated phone line for each data peripheral used at a remote location can cost your MIS network thousands of dollars a year in line charges. Multiply that by the number of locations in your far flung enterprise and what have you got? An antiquated means of gathering remote-site data that saps the budget dollars right out of your MIS department. The PolNet ACP-5 Voice/Data Processors alleviate network dependency on dedicated lines by expanding any existing voice line to accommodate up to 4 extra devices. That's a total of five communications devices sharing one phone line - efficiently and effectively. We guarantee the ACP-5 will process calls to any type of data equipment that requires a phone line to function: any type of modem - regardless of speed, throughput or standard, and type of data terminal - credit card authorization machines, money order terminals, Underground Storage Tank monitoring systems, alarm/energy control systems and more. Stop wasting money. Incorporating PolNet ACP-5 into your information network can have a dramatic positive impact on your budget! Use the Polnet ACP-5 and save the expense of 4 phones lines. *Note: All prices include shipping and handling in the US and most of Canada. We reserve the right to charge up to the actual price of shipping on all orders outside the continental United States. All orders shipped UPS Ground unless specified. For air and express shipments, appropriate charges will be applied to your order. The Polnet® ACP is made in the USA. Interested in purchasing the Polnet? Questions about the Polnet ACP series? Call toll free (866) 337-0965 with your questions or to order by phone.